Evernote is getting ready to release a major redesign to its iOS mobile app for the iPhone, iPad, iPod Touch, and even iPad mini, following this week’s announcement of Evernote 5 for Mac. Based on the screenshot and demo video Evernote provided us, the app’s interface will be completely reimagined. Navigation buttons will be replaced for a brand new look and feel that imitates file dividers. The visual appeal of Evernote’s current app is lost in the muted gray tones and inconsistent icons so the update’s emphasis on larger images, and of course its trademark green color will be a refreshing look that many long-time Evernote users will enjoy. In the grand scheme of things, the new Evernote design makes it much faster to navigate between files. The update is motivated by speed, and so “everything needs to be one or two taps away.” The existing Evernote app, for the most part requires just two taps to access your saved files, create new notes, or to access other areas of the app. And the only features that are accessible in three steps are the camera, voice notes, and existing images. Evernote 5, however, will require just one step since the icon to create a new note and take a photograph sits on the homepage of the app. “You want the app to easily support your preferred organization scheme. If you’re a tagger, then tags must be front-and-center. If you put everything into notebooks, then those need to be quickly accessible,” Evernote’s head of marketing, Andrew Sinkov wrote in a blog post. When Evernote 5 is released, you’ll notice a new navigation section titled “Places.” A map with an overlay of note will allow you to revisit the notes that you’ve taken in locations around the world. It’s a feature that was already added to Evernote 5 for Mac, and in fact many of the features like Atlas and cards from the Mac app seem to have been ported to Evernote 5 for mobile devices. Both apps will have a “Premium Features” tab added to the app where these can be quickly accessed and managed. The iPad app will get a bonus feature at the top of the app, like a slideshow, that allows you to review recent notes. Sinkov didn’t reveal when the Evernote 5’s mobile app will be released, and merely saying it will be sometime “soon.” But Mac owners can get access to Evernote 5 for Mac’s Beta app right now if you’re antsy. 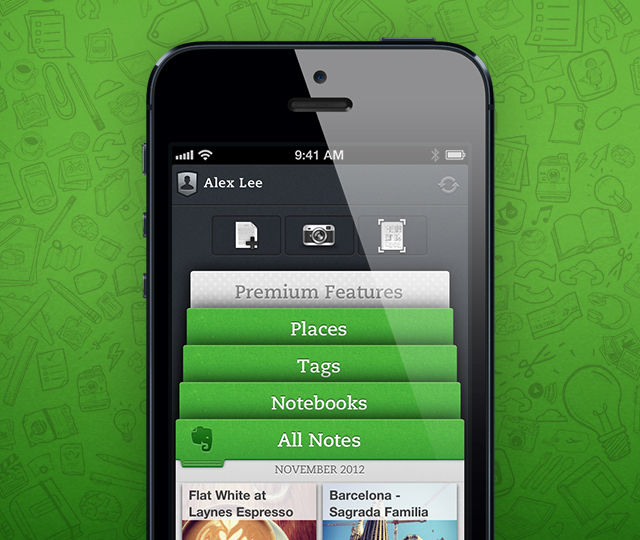 The steps to gain access to the Beta app are provided here by Evernote. Evernote does recommend users wait for the general update since installing the Beta app puts them at risk of data corruption or loss.